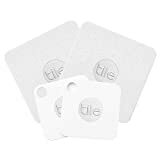 Tile’s Bluetooth-powered tracking tags are the best in the business, but rivals have gained notoriety because Tile’s tags are so much more expensive than other options out there. At least, that’s normally the case. Amazon has a deal going today that drops both the Tile Mate and Tile Slim to their lowest prices ever, about $11.48 a piece. The Tile Mate and Slim Combo Pack includes two Slim trackers and two Mate trackers, and it dropped to just $45.90 while supplies last. This is a deal you’ll definitely want to take advantage of before it inevitably sells out. The Tile Combo pack includes 2 Tile Slim and 2 Tile Mate Bluetooth trackers – perfect for keeping track of your essential items like your keys, bag, wallet, and laptop. Use your smartphone to make your Tile ring when it’s nearby but out of sight. Can’t find your phone? Simply double press the button on your Tile to make your phone ring -even on silent!